Just Add Color Review by Emily Terrell | Just Add Color Adds to All Your Party Fun! We love to play and get messy as a family! Okay, sometimes my husband isn't too thrilled, but the rest of us love to. We also really enjoy getting together with family and friends to play games. And when you can combine those two joys into one... you get Just Add Color! Just Add Color comes from a desire to make festival fun come to your private party! Any kind of party! Even better when you crank up the music. 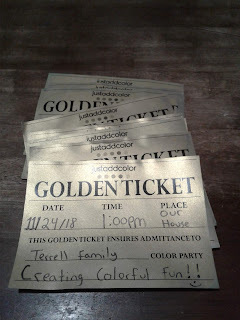 There were also Golden Ticket invitations, rubber bracelets and tattoos! I loved the tickets most of all. Really adds to the magic of the event. The bracelets and tattoos give you some fun ways to identify your participants. The colors come in powder form - perfectly safe for throwing at each other without causing discomfort. 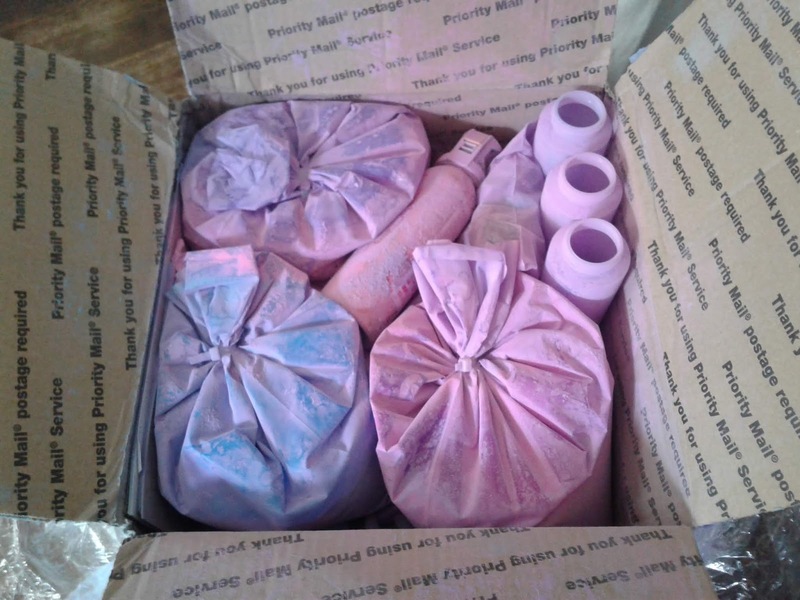 My powder packs had some leakage, but knowing our mail carriers - I wasn't surprised. 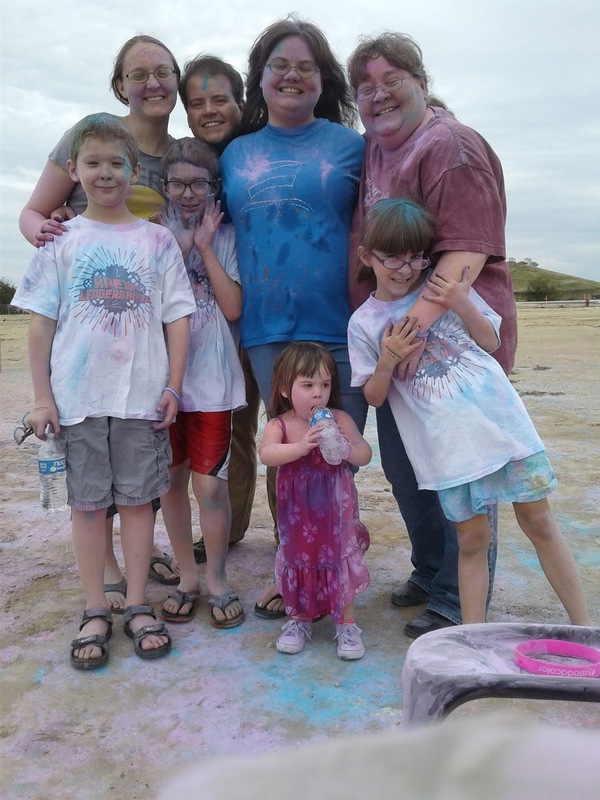 With the Party Guide you can play colorful powder games, have color dances and colorful crafts at your next party or event. 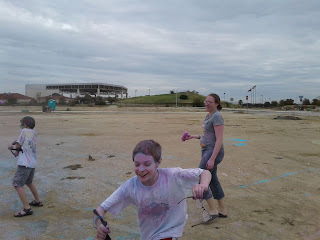 I was hoping to do some human canvasing, but the powder started disappearing too quickly. Every party can be more fun (maybe even 10x more fun!) 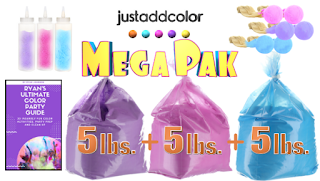 with this colorful pack. Our family started tossing color before we had really settled in the spot and then we couldn't be stopped until the powder ran out! The creator of this amazing pack - Ryan Johnson - came up with the guide to show you how to plan, prep, throw and clean up after an amazing party. He outlines his favorite games and things to do with the pack. I loved reading how he got started with this idea. I won't spoil it, however, so I'm sharing the About link and only saying that his daughter and her birthday was his inspiration. 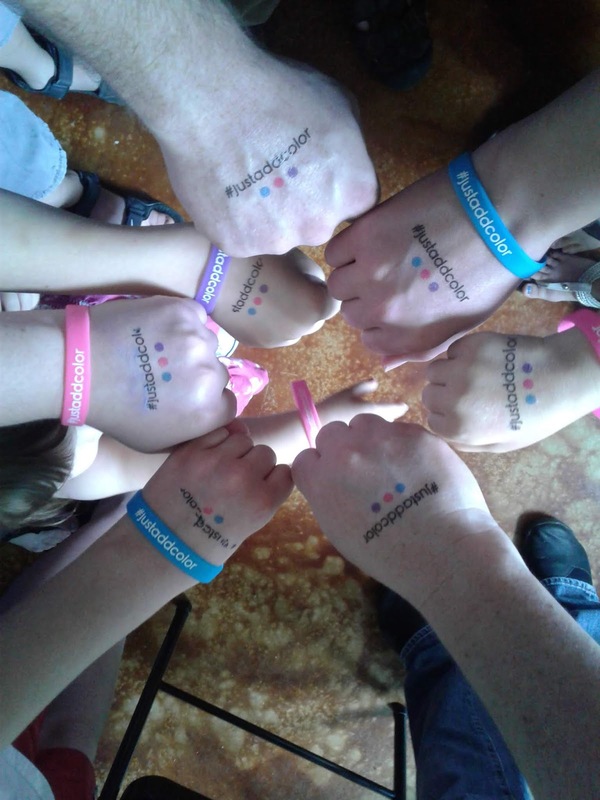 When parents get inspired to go above and beyond for their kiddos, amazing things happen! But he didn't want to keep something like this all to himself. He wanted to branch out and share it with everyone else who is interested. Some might call him crazy. I call him inspirational! I saved this for when my in-laws came down for Thanksgiving. That way we could have a blast together. We took it to a wide open field to play. Plenty of room to spread out and run in! 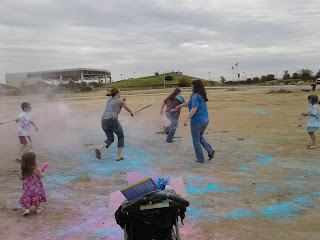 We talked about the games, but once the powder-flinging commenced... let's just say that we chose to chase each other and spread the color as much as possible! We get pretty competitive when it comes to games. My husband and Mother-in-law are asthmatic and brought face masks in case the powder became too much for them. Which was a good idea. Didn't want them having flare-ups. We also had water on hand. The baby got a bunch of the powder in her face and tried to lick it. She learned the hard way that it wasn't pleasing to the palate and doused her mouth (and dress) to get it out. I enjoyed the Bonkers best. Simple, but fun! My husbands favorite was the Powder Blaster. If they could be refillable, it would have been ever better. I described them as being mini fire extinguishers. Sadly, these have been discontinued. They didn't fully empty out and work properly. My suggestion to make everything fun to the highest level? Fill all your gear before you start. Otherwise you have to have someone standing by to be the filler. Having music would have made this even better. Unfortunately, we did not have a portable device that would play it loud enough. Yes! Just hot water will wash away the powder. However, Ryan did say there are exceptions and to be ready to tie-dye! 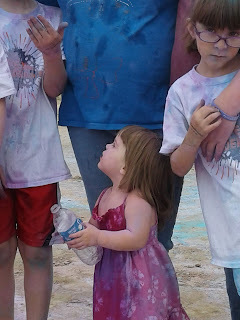 I had my kids wear clothes that I didn't care about staining, just to be on the safe side. Also - I would suggest wearing something like sandals or flip flops, most definitely not new sneakers. Ryan clued me in that the powder can get into the seams or on white leather which can be difficult to clean or can ruin them altogether. So keep that in mind. Most of us wore rubber sandals/shoes - totally washable. 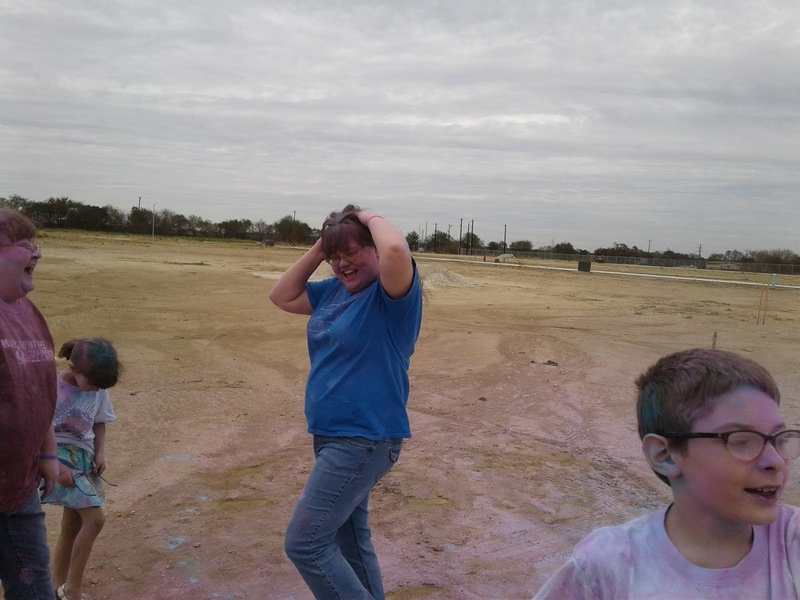 He also said that there have been reports that light dyed hair can be stained by the color. So make sure your hair gets covered by a hat or bandana to be on the safe side. If your guests don't bring a change of clothes, make sure you give them plastic or trash bags to cover their vehicle seats. Saves on having to do a major clean in the ride later. Though I saw that he is now offering seat covers in the pack! Check out my list below or make up your own and leave me a comment below! I'd love to know what you think about it. Get a one-time-only discount, Money Back Guarantee and Shipping (for FREE) when you purchase your Just Add Color Party Pack right now! Was $150, now just $75! I'd love to know what you think! Leave me a text below. How could this be useful for you?